It’s well known that tracing our family tree back 400 million years reveals a fishy past. This history is enshrined in our DNA in the pattern of nerves that control breathing. From time to time that control throws a wobbly in the form of involuntary spasms of the diaphragm manifested as a fit of hiccups – what the medics call singultus, which in Latin means sobbing – readily brought on by contemplating a comprehensive map of intracellular signalling pathways. Hiccups, however, are caused, as Neil Shubin, in his wonderful book Your Inner Fish has explained, by a mis-firing neuron in our brain stems that produces the type of electric signals that control the regular motion of amphibian gills. A genetic recipe hoarded in the nuclear loft is inadvertently recalled. For the most part this result of DIY evolution is no more than mildly embarrassing, although the poor fellow who made the Guinness Book of Records by hiccupping for 68 years may have used a stronger term. As we’re really talking about cancer, we should mention that persistent spasms of hiccups and difficultly swallowing may be indicators of esophageal cancer, where a tumour in the gullet (the tube connecting the back of the mouth to the stomach) grows into the trachea and flips the hiccup switch by mechanical pressure. Whilst the key feature of all these pathways is that they connect the outside world to the nucleus of a cell, it’s become clear that each pathway does not exist in isolation. Individual pathways can talk to each other – sometimes called cross-talk – individual domino runs intersecting, if you like. So evolution has cooked up thousands of proteins floating around in our cells that can be mapped into discrete signal pathways but, in the molecular jostle of the cell, each may affect any of the others – if not directly then via just a few intermediates. To avoid the Tokyo subway syndrome it’s easiest to think of the cell as a blancmange: poke it anywhere and the whole thing wobbles. The complex network of signalling pathways in cells. Left: the dots represent proteins that inter-communicate (lines) – best thought of as a blancmange. Why is grasping this picture of what seems like a molecular madhouse important? Well, one thing we should bear in mind is that the set-up may look chaotic to us but our cells somehow make perfect sense of it all because they take clear decisions as to what to do. But the reason for grappling with it at all, other than to be humbled by our ignorance, is that these signal systems are a major target for anti-cancer drugs. To be more precise, it’s disruptions in these proliferation-controlling pathways, caused by mutations, at which we take aim with the contents of our drug cocktail cabinet. What goes wrong in cancer? If you want a three word definition of cancer ‘cells behaving badly’ will do fine. If you insist on being scientific ‘abnormal cell proliferation’ covers it nicely, meaning that control of cell replication has been overcome to the extent that cells reproduce more rapidly than they should or at an inappropriate time or in the wrong place. Underlying this abnormal behaviour is damage to DNA, that is, mutations. This remains true even if the initial cause does not directly affect DNA. It’s estimated that about 20% of the global cancer burden comes from infections, mainly in contaminated drinking water. These can cause chronic inflammation that eventually leads to mutations and thence to cancer. Other factors, for example, tobacco smoke and radiation, can directly damage DNA and about 10% of cancers are set off by what you might call a taxing inheritance – mutations already present in DNA at birth. The capacity for high-throughput sequencing of complete human genomes has spawned ambitious projects that include Genomics England’s sequencing of 100,000 genomes by 2017 and The Cancer Genome Atlas that aims to provide a mutation data base for all the major cancers. One of the most mind-boggling facts that has already emerged from this revolution is the extent of disruption that can occur in the genomes of cancer cells: as many as one hundred thousand mutations within one cell. For the sake of completeness we should note that, cancer being cancer, the mutational spectrum is astonishing and, at the other end of the scale, there’s a childhood leukemia that results from just one change to DNA and there’s a type of central nervous system tumour that appears to develop without any mutations at all. For the most part, however, cancer cells carry a mind-boggling number of mutations and the assumption, nay hope, is that the vast majority of these changes are ‘passenger’ mutations that do not affect cellular behaviour: they’re a by-product of the genetic mayhem characterizing cancer cells. The ones that count are ‘driver’ mutations that can arise in any of several hundred of our 20,000 or so genes, changing the activity of the proteins they encode to contribute to cancer development. Only a small number (half a dozen or so), of these drivers, acting together, is required for cancer to emerge. Thus, although only a relatively small group of ‘drivers’ is needed, almost limitless combinations can arise. The accumulation of mutations takes time, which is why cancers are largely diseases of old age: two thirds of them only appear in people over the age of sixty. The estimate is that if we lived to 140 everyone would get cancer but, pending that happy day, when or whether the disease manifests itself in an individual is indeed a matter of genetic roulette – genetic evolution within cancer cells. So wonderful has the technology become we can now inspect individual cells in tumours to reveal that driver mutations occur in single cells that can expand to form groups of cells, called clones. These multiple clones can modulate their mutational profile independently and, as a result, proliferate at different rates. So you can picture tumours as a complex patchwork of genetically related, competing clones. In other words, as we’ve suspected all along, cancers are a form of dynamic Darwinism. The critical point is that key mutations drive cancer and they do so by upsetting the normal working of signal pathways that control whether cells proliferate or not. You could say it’s Nature poking the blancmange but these are delicately selected pokes – the product of the evolution of a cancer’s genetic signature – that just tweak signalling mechanisms enough to make cells a little more likely to multiply. 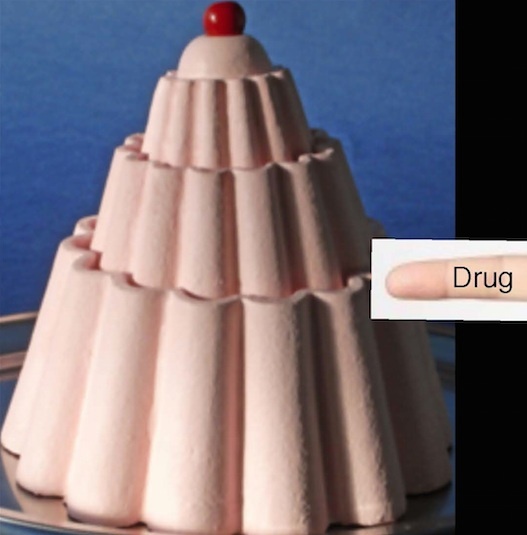 In coming up with drugs that target specific mutations we’re giving the blancmange another poke – the aim being, of course, to prod it back to normality. Having mentioned that, albeit very rarely, cancers emerge that don’t seem to be driven by changes in the sequence of DNA – how do they do that? The answer lies in epigenetic modifications – any modification of DNA, other than in the sequence of bases, that affects how an organism develops or functions. They’re brought about by tacking small chemical groups either on to some of the bases in DNA itself or on to the proteins (histones) that act like cotton reels around which DNA wraps itself. In effect this makes the DNA more difficult to get at for the molecular machines that turn the information in genes into proteins. So these small chemical additions act as a kind of ‘super switch’ that can, for example, block genes that act as brakes on cell proliferation – hence promoting cancer. Neil Shubin Your Inner Fish, Random House, 2008. Accordingly, this and the next three posts will be a recap – even better a refresher – a gentle think about the problem that is cancer and how we’re doing. And before you say ‘after umpteen essays’ (96 to be precise but who counts when you’re having fun?) ‘this sounds a bit cart before the horse-ish’ let me just emphasise that the ‘horse’ was really Betrayed by Nature. It is now 43 years since President Richard Nixon signed the National Cancer Act, thereby launching what has frequently been referred to as the ‘war on cancer’ in which prodigious sums of money have been committed to the cause of understanding cancer biology and thereby developing more effective treatments. The aim of this is, of course, to eliminate cancers as a major cause of death. It is debatable, to say the least, whether this largesse would have been distributed with quite such gusto had the crystal ball been peered into with sufficient intensity to reveal that in 2015 well over half a million Americans will die from cancers. That does not sound like an unmitigated success story – nor is it – but the immense amounts of perspiration, sprinkled with the odd moment of inspiration, that have gone into cancer research have yielded a staggering amount of information. Fuelled in particular by the astonishing technical revolution that permits the complete DNA sequences of human genomes (i.e. the genetic code) to be obtained within a day or so, we can now survey in extraordinary detail the molecular basis of this diverse ensemble of diseases that are driven by the acquisition of mutations in components that regulate the fundamental processes of life. A major objective of all this industry is, of course, to come up with drugs that complement or, ideally, replace surgery and radiotherapy for the treatment of cancers. It’s nearly seventy years since the Buffalo-born pathologist Sidney Farber, working at the Harvard Medical School, launched this odyssey and the intervening period has seen stunning triumphs with remission rates for some formerly untreatable cancers now at nearly 100 percent. But one of the most amazing revelations of all has been the facility with which cancers manage to circumvent drugs designed to kill them. The upshot is that drug resistance is a major limitation to the effectiveness of chemotherapy and most cancer deaths occur because cells outwit the available drugs. The saga of how tumour cells manage to be so adept at evading mankind’s efforts to skewer them is both fascinating and relevant to all. Like every good story it has a beginning and a middle, which is pretty well where we are at the moment. It will also have an end – although opinions are divided as to what that will be. All animals are created and maintained by chemical signals (messengers) telling individual cells what to do. For example: make more cells (proliferate)/make a different type of cell/move to a different location/do nothing/die. Once a messenger contacts the surface of a cell it sets off a game of molecular dominoes: relays of proteins are activated that transfer a signal to the nucleus – specifically to the machinery that reads the coding sequence of genes within DNA and transforms that into proteins. Proteins are the machines of life: workhorses that make things happen so that vast clumps of cells (i.e. living organisms like us) behave in a coordinated fashion. The signal pathways within cells are complex: best not to Google ‘signalling pathways’ as you’ll be presented with a jumble looking for all the world like a map of the Tokyo subway. But essentially they’re linear stepping stones from membrane to nucleus so it’s convenient to think of them as a telephone system – hundreds of callers (messengers) being put through to the appropriate receivers, i.e. gene targets. Convenient but somewhat misleading as life is rather more complicated. The reason for this is that cells (and with them life) have evolved on a trial and error basis. No bearded electronics whizzo up in the blue yonder sat down with a pencil and paper and designed the ‘best’ circuits that were then assembled in some celestial workshop to remain fixed for all time. Instead we are the result of what in Betrayed by Nature I called the ‘genetic roulette’ of Darwinian evolution. Our signalling pathways resemble the wiring in an old house that has been modified, extended and tweaked by successive owners over many decades. New lights here, a replacement phone line there, etc. with the old cables being disconnected but left in the walls. Animals are much the same except that their redundant wiring accumulates in their genomes, unrequired but lurking and occasionally capable of being reactivated. Diverse chemical signals activate multiple pathways within cells, ultimately regulating the machinery that reads the genetic code carried by DNA in the nucleus. 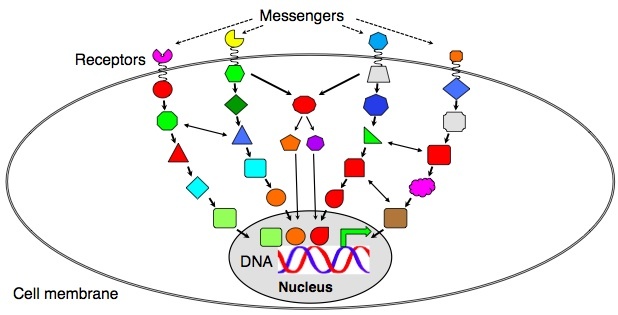 These pathways could be thought of as domino runs of different proteins (colored boxes) tripped by the molecular switch of messenger binding to receptor. Rather than acting in isolation, pathways may diverge and/or converge and components may interact, directly or indirectly, giving rise to ‘cross-talk.’ The whole assembly is thus best thought of as a signalling network. That will do for now: next time we’ll look at what can go wrong. You might not have thought of it in quite this way but cancer biology is a bit like having kids. It seems you only have to turn your back and things have changed, not so as to be unrecognizable but enough to have you blinking in surprise, shock or horror. In the cancer field it’s true that, especially over the 12 years since human DNA was first completely sequenced, a fair bit of the jaw-dropping has been due to astonishing technical advances. Thus human genomes (i.e. their DNA sequence) can be laid bare in 24 hours – The International Cancer Genome Consortium now has over 10,000 cancer genomes in its database – and the power of the panoply of ’omics methods to probe ever deeper into the mind-boggling complexity of tumours is quite staggering (we risked a quick peep at just how tricky it is to disentangle a picture of the biology from the vast amounts of data in A Word From The Nerds). These revelations often leave us gasping at the variety and adaptability of nature and how that shows up time and again in the microworld of cancers. Of course, we’re used to the world being ever-changing but we like to think there are some things that are fixed. The Earth still rolled round the Sun even after the aeroplane was invented. When it comes to cancer the simple but fairly firm idea is that cells pick up changes in their genetic material (i.e. mutations in DNA) and if these affect an appropriate set of genes (i.e. encoded proteins) a cell starts misbehaving – multiplying when it shouldn’t or faster than normal. And that’s cancer. Of the twenty-odd thousand genes that make human beings, several hundred have this ability to be trouble-makers – and a handful at any one time (perhaps five to ten) is all it takes. Like any team, there are some high profile players: genes that crop up time and again in mutant form driving all sorts of different tumours. There’s maybe a dozen of these. The rest are bit part players: actors who can steal the show with a cameo role. In others words they’re low frequency cancer drivers, perfectly capable of doing the job but generally keeping a low profile. All of which is fine: we can hang on to what we thought we knew. Cancers are caused by cumulative mutations – things are just complicated a bit because of the more or less infinite subtlety that the different combinations can cause. So cancer’s really pretty simple. However, just once in a while – mercifully, or we’d all go potty – something comes along that has us, if not standing on our heads, at least wondering which way is up. Welcome Iñigo Martincorena, Peter Campbell and pals from The Sanger Institute in Cambridge – a regular source of wide-eyed wonder in genomics. They’ve just done something that, on the face of it, was very odd. They carried out a thorough sequence analysis of samples of normal human skin, the skin in question being from eyelids. The plan was to try to get a picture of how cancers develop and eyelid skin is a good place to look because it gets a relatively high exposure to sun. Moreover, it’s easier to get hold of than you might think: there’s an age-related condition in which the skin loses its elasticity causing the eyelid to droop – which can be treated by surgery, i.e. cutting out some of the skin. Fasten your seat belts: here comes the shaker. In 234 eyelid samples (biopsies) from four people the number of mutations was similar to that in many cancers! Yet more amazing, the mutated genes included most of the key ‘drivers’ of one of the major forms of skin cancer. Putting numbers on it, they found about 140 driver mutations per square centimeter of skin. The type of DNA damage was characteristic of the effect of ultraviolet light (e.g., changing C to T – i.e. the base cytosine is mutated to thymine) – so at least that wasn’t a surprise. Groups of mutant cells (clones) in a 1 square centimeter of normal eyelid skin. 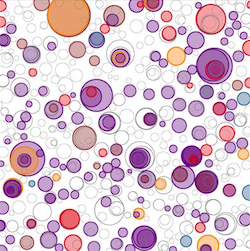 The circles represent samples of skin that were sequenced. Their sizes and the representation of nested clones are based on the sequences obtained. The outermost layers of normal skin can therefore be viewed as “effectively a battlefield of hundreds of competing mutant clones in every square centimeter of skin.” (from Martincorena et al. 2015). As Iñigo & Co put it ‘aged sun-exposed skin is a patchwork of thousands of evolving clones with over a quarter of cells carrying cancer-causing mutations.’ Notably, there were clones carrying two or three driver mutations – and yet the tissue showed no sign of cancer and functioned quite normally (apart from its wonky elastic). So, there are thousands of mutations in each skin cell with hundreds of evolving clones per square centimeter and the profile of driver mutations varies between individuals. The obvious question, therefore, is ‘why isn’t this tissue cancerous?’ We don’t know but, given that key ‘drivers’ are present, it seems that these cells either have a kind of master ‘off switch’ that suppresses potent driver combinations or they need a further ‘on switch.’ There’s no evidence for either of these, nor is it clear whether other cell types can show this kind of restraint. And there’s one more troubling point. Many cancer drugs are designed to target driver mutations and thus to kill the carrier cells. But if these mutations can crop up in normal cells, any such ‘cancer specific’ drugs might cause a good deal of what the military term collateral damage. As ever in science, an exciting new finding raises yet more questions. Answers will be forthcoming at some point. Just don’t blink! Martincorena, I. et al. (2015). High burden and pervasive positive selection of somatic mutations in normal human skin. Science 348, 880-886.